It being February, there really isn’t much to be done out in the garden apart from marking out the beds to be dug and making endless hopeful lists of seeds and plants to be bought, but that doesn’t mean that a great deal of fun can’t be had experimenting in the kitchen! Recently I’ve been having a lot of fun creating recipes for infused wine vinegars, and this morning I made up a batch of two of the most recent ones, one sweet and one savoury. This is really simple to make! Just peel and chop the garlic cloves – bash them with a knife if you want to, first – and pop them into a jar or wide necked bottle. Give the rosemary a good bashing in a mortar and pestle and then pile that in as well, then add a few peppercorns – I used white ones this time as I happened to have whole ones in the cupboard. I didn’t bash them first for this recipe as I don’t want too much of a punchy pepper kick in the vinegar, though I may crush them next time just to see if it makes any difference! Lastly, pour some red wine vinegar over the mangled herbs and put the lid on. This lot will be left to steep for at least a week, more like two, and in fact there is a strong chance that I will just leave it all in the bottle and pour off the vinegar as and when needed. I suspect this blend will be delicious stirred into cous cous or quinoa. 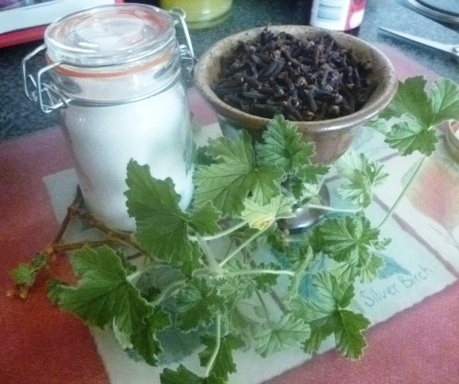 Fresh rose geranium leaves – a good handful. 1 small piece of vanilla and a good two heaped spoonfuls of vanilla sugar if you have it. If not, try vanilla essence and raw cane sugar instead. Chop the rose geranium leaves and pile into the bottle, along with the single clove and the sugar and piece of vanilla pod. Pour on the red wine vinegar! Pop the stopper in, swirl around to disperse the sugar a little, then leave for at least two weeks. I’m going to use white wine vinegar for this recipe next time, but for this time at least, I am working on the theory that rose geranium is such a punchy flavour that it should work with the red wine flavour rather well. It may be that I will want to add more sugar to this after it has finished steeping, though. This one could be added to fruit salad, trickled over ice cream or used as a dipping vinegar for fresh bread. I also started a batch of garlic oil this morning – I’m happy to post a recipe for that if folks want one! Fab! The wonderful thing about herbal vinegars is you can use either fresh or dried herbs, which is handy. I’m going to do loads more with herbal vinegars this year hopefully, including loads more dessert themed ones that can be mixed with honey instead of sugar… It’ll be fun to experiment with, at the very least! I shall post lots more recipes this year, I am determined! 😀 I hope you continue to enjoy the blog! Previous Previous post: Back, at Long Last!